Our QA/QC Department ensures that all products are manufactured to your required specifications. Whether manufactured to corporate specifications, industrial or government standards (ex. ASTM, ASME RTP-1, NBS PS 15-69, BS4994, DIN, ANSI or AS), our products are backed by a 12-month warranty. 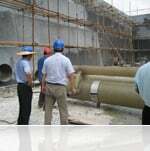 We welcome third party inspections of our manufacturing facilities. We are pleased to announce that Chemposite-Zhongshan FRP Ltd., China Manufacturing Facility is ISO9001-2000 Certified.